New! See my Sim Racing Survival Guide! 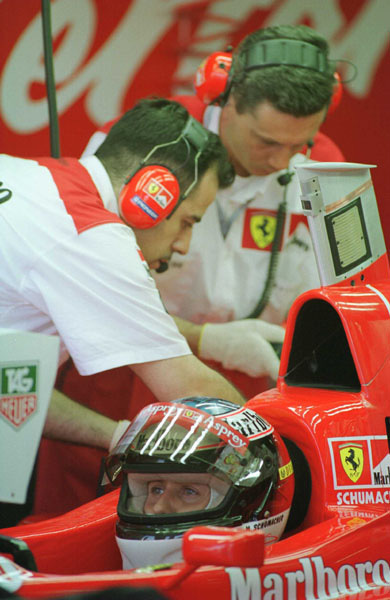 You are on the grid in a Ferrari at Monza. Your hands grip the wheel, thumbs hooked over the spokes. Your right foot is on the accelerator, revs bouncing against the rev limiter. The air is filled with the sound of screaming V-10's. The lights go red...then green! You're away! 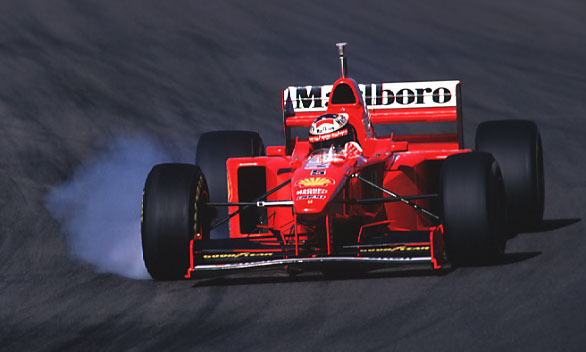 Clouds of smoke fill your mirrors, the engine note rises...the Ferrari's rear wheels are beginning to spin. You lift slightly, the tires hook up, and then you're hard on the throttle, but not before Jacques Villeneuve edges ahead on your left. 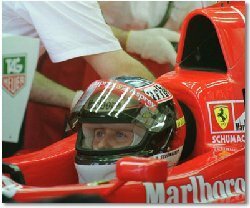 Up through the gears, the Ferrari V-10 wails: 2nd, 3rd, 4th, 5th; now Michael Schumacher, in the other Ferrari, is filling your mirrors as you scream down to the braking area for the first chicane. Bravely, you pull to the left and leave your braking till a split second after Villeneuve. You dive by on the inside, turn left, and scrabble onto the line, tires squealing as you push them past their optimum slip angle. You are already squeezing on the power again when Ferrari touches the curb at the apex of the right-hander. The right side of the chassis jolts upward, then thumps back down. Unsettled, with power on, the car starts to slide. You lift, react with opposite lock, but it's too late. In an instant, the Ferrari is spinning, launching off the track into the gravel trap. For a moment, the car teeters on two wheels as it digs into the gravel, then it settles back down on all fours. Through the dust and flying rocks, you can see the field, bunched up to avoid your blunder, begin to stream by as you slide backwards to a halt. Fantasy? No, not at all. I did this myself the other day, sitting here at my desk. Welcome to the world of modern computer racing simulations.